looks lush ! love the crochet blanket especially ! I'm looking at green with a new respect since seeing the shot green in your string quilt and the green Rita uses in her one in the middle of your mosaic. You guys really know how to work it! i'm loving the green too- especially after seeing Rita's dream on version! Love lime green! Very cool mosaic! I am especially fond of green... bright! great mosaic! I LOVE green and was just saying today I would really like to make a green and white quilt - yummy!! Yum. Gives me a new appreciation for the colour green, Andi. 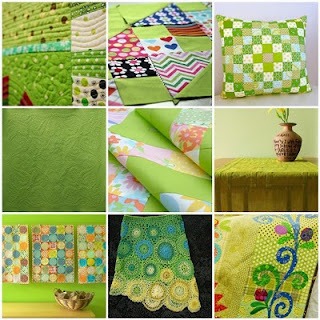 Makes me want to dig out the green scrappy quilt I've buried under other WIPs.